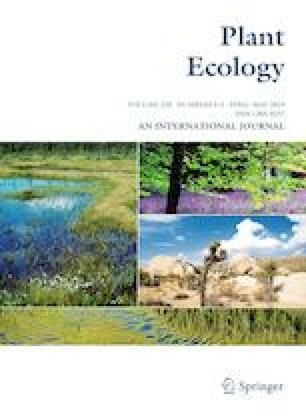 Environmental constraints on both functional traits and trait–trait correlation patterns are extremely relevant research questions to understand assembling mechanisms and scaling processes in ecology. In fact, community weighted mean (CWM) and functional diversity (FD) metrics assimilate meaningful complementary information from species to community level. Relating species abundance data from national forest inventories (France, Italy and Spain) with species trait values from published sources, we explored CWM and FD variations along climatic gradients for traits related to leaf, hydraulic and live history strategies, and how the CWM or the FD of single traits co-vary. Results show how the combined effects of water availability and temperature modulate CWM, and to a lower extent FD, of Western European forests. PCA on CWM traits data showed that main axis accounts for 46.6% of the variability and is represented by wood density, seed dry weight (SDW) and maximum height. This axis is similarly preserved in humid and dry areas and potentially related to competition ability, growth rates and successional status of tree species dominants. Furthermore, the second axis is associated with leaf wilting and cavitation resistance (P50), but not consistent in dry areas. Correlation patterns of FD data, which were partially preserved across climatic regions, showed one main axis involving the joint variability of all traits. However, between humid and dry areas determinants of SDW and P50 differ from all other traits. Results showed that at least a part of the co-variation patterns among traits change with climate conditions, suggesting scale-dependent effects which should be taken into account when scaling assembly mechanisms. The online version of this article ( https://doi.org/10.1007/s11258-019-00928-x) contains supplementary material, which is available to authorized users. Communicated by James D. A. Millington. J.M. Costa-Saura was supported by a scholar grant under the project SIM4NEXUS (No. 689150) from the European Union’s Horizon 2020 research.